"Long Journey Home" (Soundtrack) This Grammy-winning release and soundtrack to the hit Disney/PBS series "Long Journey Home: The Irish In America" (directed by Tom Lennon) is a collaborative effort between Chieftains' leader Paddy Moloney and Brian Keane. The film is six hours long and spans four episodes. 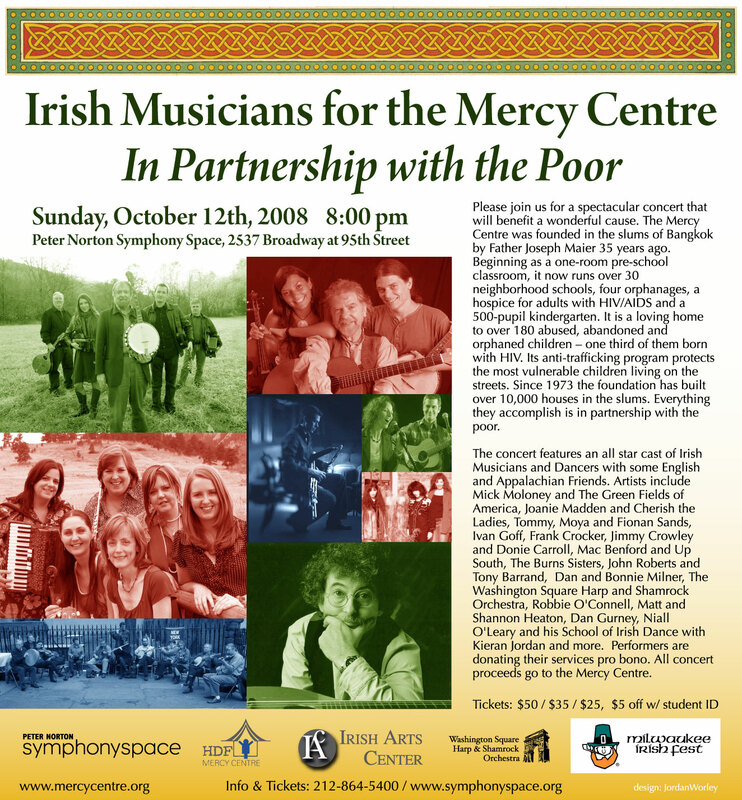 Research for traditional music was provided by Paddy Moloney and Irish-American musician/historian Mick Moloney. Irish Music in America: Continuity and Change . Mick Moloney. Ph.D. Dissertation (Folklore) University of Pennsylvania, 1992. Though he now downplays this work, for its time Mick Moloney’s doctoral dissertation was a groundbreaking piece of research on traditional music in America. It is somewhat useful as statistical ethnography, but the heart of the material is the fieldwork interviews Moloney conducted with a succession of seminal Irish emigrant players in New York, Philadelphia, and Chicago, and Moloney’s own commentary on the music. The most recent O'Riada Memorial Lecture publication "Irish Music on the American Stage" by Mick Moloney is now available from The Secretary, Irish Traditional Music Archive, Music Department, University College, Cork, Ireland. The original idea behind Cherish the Ladies was simple: a series of concerts highlighting the contributions of women to Irish music in America. In 1983, folklorist and musician Mick Moloney had a brainstorming session with the directors of New York's Ethnic Folk Arts Center, Martin Koenig and Ethel Raim. Moloney drew their attention to the extraordinary number of young American women involved in Irish traditional music. In the mid-1960s, Donal Lunny, Brian Bolger, and Mick Maloney formed The Emmet Folk Group. Mr. Ochs relates an anecdote that Mick Moloney, who is professor of Irish studies and music at New York University, recalled about meeting Russell at Euston Station in London on his first trip outside Ireland. In 1980 the Garryowen II Ceile Band, including Frankie, took part in a video recorded in the late Martin Mulvihill's home. "Did your Mother come from Ireland?" was a documentary written and presented by Conrad Fischer and Mick Moloney for RTE, the Irish national tv broadcasting service, documents the "renaissance of Irish traditional music in NYC during the 1970's and documents the renewed vitality and growth of this music, after years of dormancy, revealed through performances by second and third generation children of Irish immigrants. The second Sunday of the month is usually the rallying point for Maryland dancers and musicians. A ceili is held in the rather small area on the far side of the bar and the customary crowd probably fits it quite handily. On this day, Baltimore's preeminent traditional musician, box player Billy McComiskey, had invited down Dr. Mick Moloney, an early mentor, to come from New York for his very first J. Patrick's appearance. Mick Moloney championed Joe's cause through publishing recordings and arranging appearances. Although I do not think he has claimed any credit for it, I am assured that Moloney played a large part in Joe's being awarded The National Endowment for the Arts National Heritage Award for Excellence in the Folk Arts in 1982. This Joe saw as the pinnacle of his achievement. Living Tradition CD review of Mick Moloney, "Far from the shamrock stone"
The brainstorm of folklorist and musician Mick Moloney and New York's Ethnic Folk Arts Center, CTL formed in 1983 to play a series of concerts showcasing what was seen as a rarity: women in traditional Irish music. In the mid-70s Mick Moloney headed a huge field recording project to capture the Irish American musical scene where it flourished most, along the east coast and in Chicago. This CD spotlights Moloney's recordings of 2 generations of players from Boston, New York, Philadelphia, and Washington DC, those who didn't already have recordings out but who nevertheless were influential in maintaining and passing on the traditional styles. Featured ore accordionists Sean McGlynn and Gene Kelly, fiddlers Brian Conway, John Vesey, and Maureen Fitzpatrick, and flutists Mike Flynn and Paddy Cronin.